Spearmint has similar minty and refreshing characteristics to peppermint and it is often substituted for peppermint in aromatherapy. It is however a slightly milder acting oil and it possesses far less menthol. It is used for a range of medicinal purposes from treating headache and fatigue to oral health. Spearmint essential oil is derived from the floral parts of the Mentha Spicata or spearmint plant by a process of steam distillation. It has not been studied quite as extensively as peppermint oil but its use dates back thousands of years to ancient Greece. Spearmint has a very wide array of potential uses for your health because of its many medicinal properties which include antiseptic, antibacterial, analgesic, anti-inflammatory, anti-fungal digestive and antidepressant properties among many others. One of the most popular and effective uses of spearmint essential oil is to tame issues related to poor digestion. It has soothing, digestive and anti-spasmodic properties that can help deal with indigestion, stomach cramps, bloating, wind and a whole lot more. As we will see later, it is also one of the mist effective essential oils to deal with feelings of nausea. Whether you are feeling nauseous because of sickness, pregnancy or because of travel sickness, spearmint essential oil is one of the best natural treatments for your condition. Several studies have been done to investigate the anti-nausea potential of spearmint essential oil and the results have been very promising. I am sure that you know that spearmint just like peppermint is found in many oral health products like toothpastes and mouth washes. It is so popular because of its cooling, minty fresh taste and fragrance and also because of its excellent antibacterial and antiseptic qualities. Spearmint essential oil can be added to your toothpaste or gargled to not only keep your breath smelling fresh but also to protect against oral bacteria and fight infection. Spearmint essential oil has many of the chemical constituents such as menthol that are perfect for treating respiratory problems caused by colds, bronchitis, allergies and even asthma. When you inhale this oil it can clear the congestion in your sinuses and respiratory system. Spearmint essential oil has anti-inflammatory and decongestant properties that are guaranteed to help you breathe easier. To treat your congestion, you can either inhale the oil directly from the bottle, prepare a steam bath or dilute it and massage it into your chest before bed time. Spearmint essential oil has gentle analgesic qualities that can be used to treat headaches whatever the cause. Both spearmint and peppermint essential oil are excellent natural remedies for sinus, tension and hormonal headaches. Try massaging a few drops of diluted spearmint oil into your temples and shoulders to get instant pain relief. Like so many essential oils, spearmint oil can do wonders for your emotional well-being. It is a very popular and effective natural remedy for people suffering from stress or anxiety and even mild depression. Unlike the very powerful prescription medications for mental problems, spearmint is safe and unlikely to come with any unwanted side effects. Spearmint essential oil is also used to improve focus and concentration and is the ideal remedy for stresses and fatigue at difficult times like examinations or periods of heavy work. Try diffusing it around the home or office to improve your concentration levels and ease your overworked mind. Spearmint essential oil can also stimulate the hair’s follicles and increase circulation of blood into the scalp which in turn helps strengthen the hair and even helps hair to grow more quickly. Because of its antibacterial, anti-inflammatory and anti-fungal attributes, spearmint essential oil can be used to treat a variety of skin conditions including acne and psoriasis. As well as being used to combat chronic skin conditions, spearmint essential oil can be added to your skin care routine simply to add more life and gloss to your skin. It is also an effective remedy for fungal conditions like jock itch and athlete’s foot and can also be used to treat nail fungus. The cooling and anti-inflammatory abilities of spearmint essential oil combined with its analgesic effects make it the ideal remedy to soothe aching joints and muscles. Whether you are in discomfort following a hard day’s work, an intense workout or you are suffering from arthritis, you can put spearmint oil to the test and should experience significant natural relief. To treat your aching muscles, add 5 or 6 drops to your bath or combine a few drops with a abase oil and massage it into the affected areas of your body. It is important that your blood is able to circulate effectively around your body to ensure that you are fully healthy and your organs and muscles function to their capacity, Spearmint essential oil can stimulate your circulatory system and help blood and oxygen flow more freely. 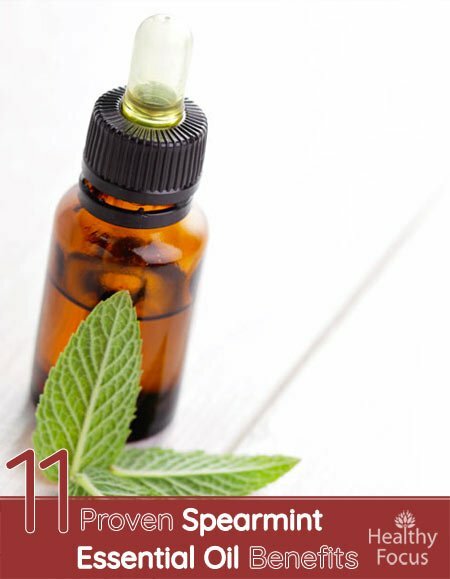 Spearmint essential oil can be applied topically to minor injuries, cuts, bruises and bites to provide relief from pain and protection against the spread of bacteria. Do not apply undiluted spearmint oil directly to an open wound but if you dilute it properly and apply it with care, spearmint oil has all the necessary ingredients to heal your wounds quickly and effectively. Massage- Combine a few drops of your spearmint oil with a carrier oil like sweet almond or coconut and rub it into the affected areas to relieve muscular pain and clear congestion. Bath-simply throw a few drops of spearmint oil into your tub and let its goodness soak into your body. Mouthwash- Add a few drops of spearmint oil to a glass of water and gargle with it each evening. Inhalation- You can inhale your spearmint oil directly, diffuse it or for respiratory issues, make a steam inhalation. Compress- add a few drops of spearmint oil to a compress and hold it against your head to deal with headaches. Make sure that you dilute your spearmint essential oil with a carrier oil before applying it to your skin. Always make sure that you perform a patch test before going ahead with a larger application. Spearmint essential oil may be safe for digestion but you should only do so under expert supervision. It is advisable for pregnant women to avoid spearmint oil because of its ability to stimulate the production of estrogen which may result in miscarriage.